Wanna know the cool thing about Audrionna and Daniel's Boulder engagement session? It fell on the perfect, and I mean PERFECT fall day that was planned months in advanced. 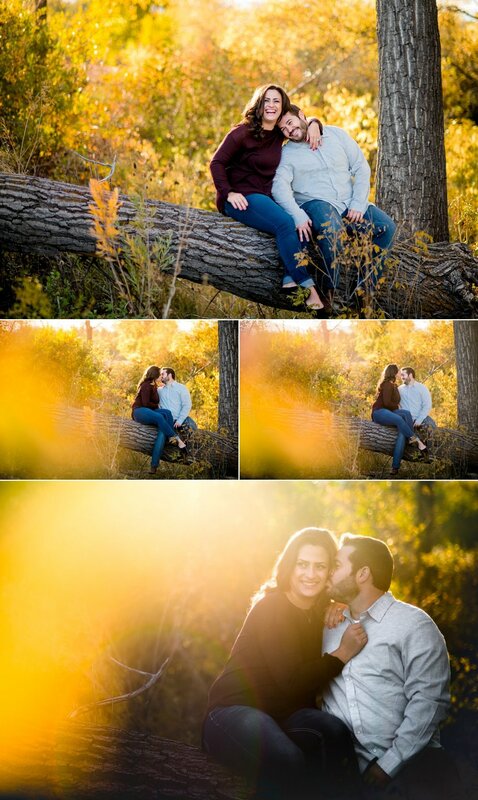 The sun was golden, soft, warm and the leaves were turning, exactly what we had in mind when discussing the Boulder engagement session. This kind of thing seems to happen a lot in my line of work. The more childlike side of me likes to believe that the universe delivers a special offering for my beloved clients. But more realistically I think that love and weddings bring out a side of us that is optimistic, mystical and leaves us with the utmost appreciation for the everyday magic of being alive and an inhabitant of this planet. I by no means would consider today to be perfect. And honestly, I really need to drop the notion of perfect anyway because it detracts from my happiness, sanity and craft. The sun is shining and that is enough for me on this Thursday in January. That is a powerful realization. One of my main goals for my business and for myself is live in a more genuine state of existence. I have strayed from that in my life recently and I’m ready to get back to it. Being a business owner is new for me, and it is not natural. I have realized that I act according to the way I perceive things need to be done. This post even is a mixture of my real true genuine thoughts and my idea of business. It’s a process, and although I am in the early stages I am on the path to figuring it out. I have made a tangled mess of tangents here but that is my authentic state today. AND Audrionna and Daniel’s adorable laughs and smiles at their Boulder engagement session are true and real so that's a win.